The most wonderful time of the year is just around the corner, which means that you might encounter a train or bus decked out with twinkling lights during your commute in the coming weeks. 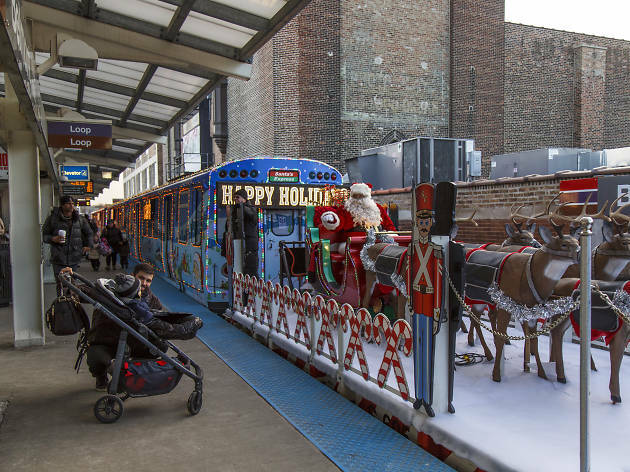 This morning, the Chicago Transit Authority announced the schedules for its Holiday Train and Holiday Bus, revealing when you can expect to see Santa making some pre-Christmas Eve journeys through the city. 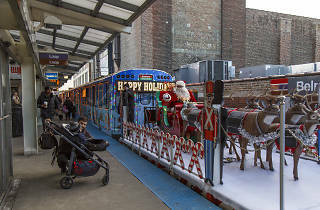 The CTA Holiday Train will begin running on Friday, November 23, with trips scheduled on every CTA line. As usual, the six-car train features an open-air platform that holds Santa and his reindeer, along with LED signs, colorful interior decorations and more lights than ever before. The Holiday Train typically runs from 1 to 8pm on weekends and from 3 to 7pm on weekdays, but you can consult the CTA website for a more detailed schedule. Just like last year, the Holiday Train will be followed by the Elves' Workshop Train every Saturday through December 15. The train is another set of six cars decorated with lights, providing more room for passengers on busy weekends when everyone wants to hop aboard the most festive mode of public transportation. If you prefer to ride the bus, you'll be happy to learn that the CTA Holiday Bus will return to 13 routes throughout the city this year. The bus is wrapped to resemble a reindeer, with a glowing red nose, a pair of antlers mounted on top of the bus and strings of lights lining the windows. Passengers will find Santa hanging out in the back of the bus, where you can snap a selfie with Old St. Nick before you arrive at your stop. The Holiday Bus begins running on Tuesday, November 27—you can find a complete list of routes on the CTA website or use the Holiday Bus tracker to figure out its exact location. Check out the complete CTA Holiday Train schedule below and head to the CTA website to find more details about the entire holiday fleet.